Jeffrey Cummings, JP Krahel, Ravi Srinivasan and Kerry Tan | Loyola University Md. 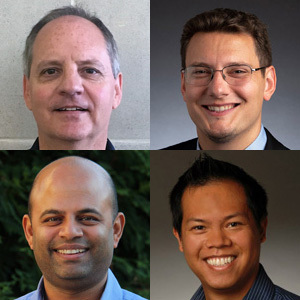 Top row, from left, Jeffrey Cummings and JP Krahel; Second row, Ravi Srinivasan and Kerry Tan. Loyola University Maryland’s Sellinger School of Business and Management promoted Jeffrey Cummings, Ph.D. to professor of management and granted tenure to JP Krahel, Ph.D., CPA, Ravi Srinivasan, Ph.D. and Kerry Tan, Ph.D.
Cummings was an investment banker and management consultant with clients including major financial institutions, software development companies, pharmaceutical companies, the World Bank and the U.S. Navy. He earned a doctorate, MBA and Bachelor of Business Administration from George Washington University. Tan was granted tenure and named associate professor of economics. Tan’s research interests include industrial organization and applied microeconomics with a focus on strategic behavior in the U.S. airline industry. Before joining Loyola, he taught as an instructor at Ohio State University. He holds a doctorate and Master of Arts in economics from Ohio State and a Bachelor of Arts in economics from the University of California, San Diego.